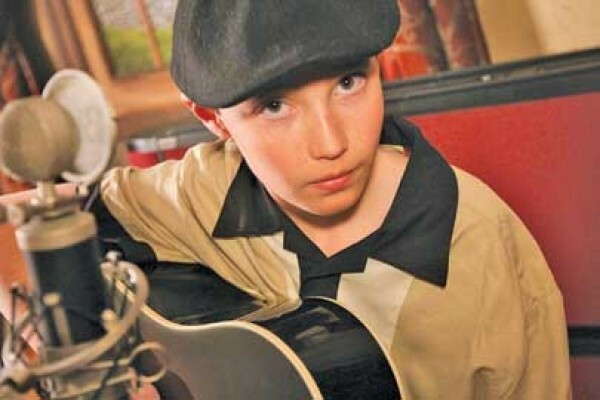 Local 13-year-old prodigy is an "old soul"
When Lindon-based guitarist and songwriter Jackson Danger speaks, it’s with a voice that doesn’t match his young age. Steady and unwavering, it’s the voice of someone who has seen a thing a two, even though, at 13 years old, Danger has only begun to experience the world. “People tell me all the time how I’m an old soul in a young body,” Danger says with an easy confidence, his vintage Gibson Hummingbird in his hands. We’re seated around a small table on a busy Saturday night in Milagros, a Mexican restaurant in Orem owned by Danger’s father, Dave. For the past two years, Danger (full name Jackson Danger Tuomisto) has been performing here nearly every weekend as Jackson Danger, serenading customers with covers of mostly folk songs from the ’60s and ’70s. Danger has a knack for attracting loyal listeners who return, week after week, to watch him play. Danger first picked up a guitar when he was 9. While other kids spend their free time mashing buttons on video-game controllers, during the summer, he practices nine hours a day, his father says. All that dedication has paid off—in April 2012, Danger was voted as Best Local Vocalist in The Daily Herald’s The Best of Utah County. “Maybe” is about the simple fact that once our loved ones leave this world, “when they’re gone, they’re gone.” The beautiful tune showcases Danger’s soulful voice and intricate finger-picking.